No references to previous years, except this decade-long one. And this includes only things I experienced this year! In 2010, I made xmas photo. In 2011, I made metaphorical things—that were intentionally symbolic of relationships and history. In 2012, I made ice cream. In 2013, I made design. In the most boring thing ever, I made my room. That is, I cleaned it. Not my bed. I would have liked to say food, since in 2014, I hosted various events with Chris and made food from scratch. I would love to say that—to brag about the dinner and 2 breakfasts that I made for my parents’ anniversary weekend on a farm, the themed parties, the way I use buttermilk in biscuits and ice cream, and how I finally figured out how to juice as much possible out of all the scraps that I have. But the last thing that I “made” as my room. This morning, as I was departing to meet a (new) friend for brunch, I frantically searched for my timbuk2 bag. A black bag with a bright blue trim that stored my bike’s lock and cable. In a fury, I tossed up my pile of bags. The Crumpler messenger bag from La Cocina that I won during an auction. The vertical computer laptop. All the various canvas bags from startups like Gilt and Airbnb. In a moment of brilliance, I remembered that I had moved the timbuk2 bag out of respect for my sister and her boyfriend. In my closet, I found the bag on top of my duffel bag. Running late, I left the disaster in my room that filled every inch of the ground. I knew that upon return, I would need to muster the energy. Nearly 8 hours later, I did so. Yet, as I picked through the mess, a biodegradable bag from a grocery store, stuffed at the bottom of a canvas bag, spilled into pieces. Now, I mean pieces. Standing true to its nature, the bag had started “decomposing” in my room and shards of white confetti spilled across my rug. With some organization, I folded the bags together. The loose canvas bags into a large convas bags. The messenger bags underneath my dresser. The coveted “purses” to either side. Then I vacuumed the remaining mess, sucking away the white confetti, my hair, dust, and random dots of remnants. If I had more time, I would make my book. I would pour my energy into truly fixing it. And I think that perhaps I have that feeling right now. One Word. Encapsulate the year in one word. Explain why you’re choosing that word. Now, imagine it’s one year from today, what would you like the word to be that captures 2014 for you? I had trouble coming up with a single word. I felt disappointment and rejection this year. At the beginning of the year, I resolved to work harder, earn an income, and finish my book. But depression and fear set in as publishers and editors said no. I poured money into writing workshops and writing coaches. Then there was an ambition to build my freelance user experience practice—to tackle unknown, intriguing areas. I had not one, not two, not three, not four, but five different intense projects this year. When I succeeded, I really succeeded. But when I failed, I really failed. But what is the point of rejection and disappointment if I didn’t learn from them. If I didn’t know what to do next time. The funny thing about progress is that it accumulates slowly. It’s not a magical cure all. Tomorrow, I won’t leap from level 1 to level 2. In fact, I may not move from level 1. But like every video gamer knows, if I keep trying and trying, I will succeed. So despite all that negative feelings, I did move forward. I did move my foot one foot and another. I may have looked back to see all the accidental fire. But I kept looking for the fresh air in the trees. I pushed through the weeds and drank the clean water when I could. Then when I reached the top of the mountain, I looked back, pleased at the progress. But then I looked upward. Because I want to keep moving forward. In 2013, it was talking to Yasar Usta in Istanbul. In 2012, it was using the ocean as a “big toilet” while floating outside Palawan. In 2011, it was my birthday moment. In 2010, it was the success in Journey to the End to the Night. For this year, I thought hard about the moments I had this year. Or as I learned from Pam Houston’s writing workshop this year, a glimmer. And for this, I want to answer with a glimmer that felt whole, that felt inspiring, that felt complete. I hesitate to talk about the disappointments and rejections. The way that I had to define my boundaries to protect myself. The way that I had to declare that you know, I really don’t like it. The way that I had to let go of a friend to heal. No, I won’t talk about those. Rather, it was this meta-glimmer at Pam Houston’s writing workshop. The assignment was to use a perspective that we rarely used (e.g. second person) and a character we rarely embody (e.g. an old man). By then, the frozen cold of the boat had shocked my bones. 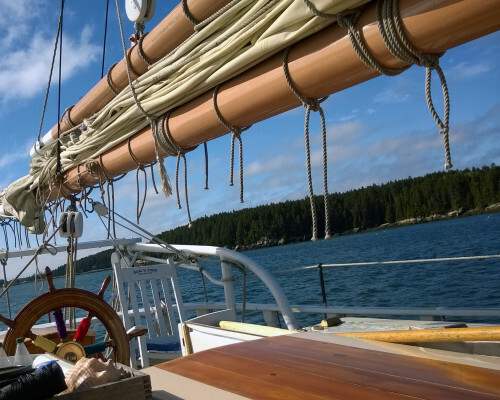 In the sun, the windjammer was inviting and adventurous. But as the evening progressed, the daylight disappeared and only the chilled air from the Atlantic remained. The cramped space in boat made everything itchy. The rocking of the boat drummed up nausea. I felt unclean. And my mind couldn’t rest to let the words fall on the page as they usually did. During the first exercise, my mind turned into mud and the usual stream of ideas did not grow. My creativity was stumped and uninspired. But suddenly with that assignment, I found hope. My pen moved across the notebook as my mind seized on second person and an older man. I wrote about a father attempting to connect with his two daughters. His desire to do what his own father could never do. The sorrow that dripped through his words over the telephone. The sorrow that was not heard by his daughters as they kept the call short. The way memories of his father’s funeral passed through his mind as he dialed the numbers. And the way how he assured himself that he was a good father. The words flowed out, but it wasn’t until I volunteered to read my draft to the group that I felt more complete. My voice, as it naturally is, shies away from public performance, but in this glimmer, I increased my volume and sat up from the stoop that I took on the deck. Then I began reading. “Have you done this before?” Pam said after I finished. “This is only my second time,” I said. “It sounds like you know how to write second person,” she said. I describe this glimmer not because I want to pat myself on the back, but because of the previous entry. I need to remember that there are times that I can succeed. They do exist. In 2010, it was a person. In 2011, it was an idea. In 2012, it was a symbol represented by a person. In 2013, I let go fear. In 2014, I let go of humility. Well, in the positive sense, of progression. I felt trapped in the fear that others would judge my self-promotion and the fact that I had no idea what I was doing. Imposter syndrome? Yes, but it’s very unlike the syndrome many women describe in tech. I am in a secure place in tech where yes, I grew less humble and demanded higher hourly rates, better working environments. But because I deserved it. But what I mean is the fear that drives me to be humble (or quiet). I still hate talking about my work, thinking that it’s lesser. But I pursued writing groups and classes. And I kept going and going. “No,” I repeated every time my parents suggested a family vacation. Years of traveling with my parents and the realization of my adulthood (aka I can make decisions on my own now) turned my shaky okays in college to a firm no. For years, I resisted the cruise ship invitations and the possibility of traveling with them on a package tour across Europe. By then, I had discovered the millenial way of traveling—the DIY style of seeking out passions, planning via online reviews and blogs, and the joy of figuring it out all on your own. Falling into snobbery, I could not stand the idea of following a tour guide holding a red flag from attraction to attraction lamely nodding my head to a voice in Chinese as my eyes drifted and my stomach growled. Besides the occasional trip for a family wedding, I avoided family vacation for more than a decade. But for my parents’ 35th anniversary, I relented knowing how much they craved family time. My sister and I planned a trip to a farm surrounded by our cooking. In doing so, we remember why family vacations are not our preferred way of spending time together. It’s not that we don’t get along. It’s that my parents vs. my sister and me have grown in separate ways. Our identities have separated and the way of living is so different. The expectations of when I was young is different. I have more worldy experience than my parents and catch the vocabulary. But that certainly doesn’t make me better. Being a child and being a parent is different when the children are in their early 30s. And vice versa, the parents who used to take care of everything now are slower and weaker. And yet, it’s not only that. It’s the moments and how we want to spend those moments, we can’t appreciate each other in those moments where we believe in relaxing. Instead, they are soaked in the decisions and memories of decades. But I admired my parents as they sang invited by our farm host. Their voices offtune and filled with Chinese accents still spiraled out Christmas songs. If Chris wasn’t at a General Assembly class (that was booked months ago) and if I wasn’t having a case of anti tag and bag (aka take everyone’s electronic devices and have them unsecurely checked in outside the theater), I would have been at the Metreon in line to see The Interview. I am not the first one to admit that from the trailers which I have seen on multiple occasions that I was unimpressed. Fart jokes. And more unseemingly jokes. Sexist and racist jokes. And a mcguffin that seemed preposterous. Yes, it wouldn’t be a movie that I would go out of my way to see. But you see, the topic. North Korea. Sometimes I do admire Seth Rogen and James Franco. And even with her bit part, Lizzy Caplan, why not? And fellow Asians, well why not? But then I started hearing news of potential terrorist attacks. I declared that I did not want to die at a movie like this. I didn’t want to go down in history as a victim of someone who went to see a movie that was about people who were making idiotic jokes. And more. Then stuff happened. And I was just so close. …for the second time in 11 years. I discovered that there’s NaBloPoMo. Here’s the funny thing. Until the last few years, I used to blog everyday. I used to write anything that came to mind in a post. Usually a theme, a scene, a moment. That was so easy for me (obviously evidenced by the more than 10 years in the right column). I am shameless in blogging. In this blog. It’s easy to write short form and I have practiced it for so many years. I almost laughed out loud. But then I realized that I had always done it, so it comes so naturally to me. All I had to do was build time for it, which by now, had become part of my daily routine. But to write longform? To write an entire story where I had to set the scene, build the tension, build characters, carry the story with short moments, then long moments, then the arc, and the character transformation? That, my readers, is hard. In doing all of this, it seems easy because you haven’t experienced it. The consumption part is the easy part. The actual creation part, people think, is easy, because it was so easy to consume. It’s like how people think a company name is easy. It’s how people think designing an mobile app or logo is so easy (look! you can just do it with just a single pen stroke!). It’s how people think that deciding the right color and font face is easy. It may be, but then that person is just very lucky. It’s not easy until you have experienced it. Then it becomes easy because you have done so often. That you have built a thick skin and have established your body to expect these moments…that it seems easy. The recent storm closed schools in San Francisco and Oakland. Because of the dangerous rainstorm. Now it’s not the rain that caused the danger, it’s the old infrastructure (like in an earthquake) that causes the danger. When I was in Pittsburgh briefly, I hoped that I would experience a snow day. A glorious day where the snow piles are so high that the only thing to do is huddle inside around a nice fire. No such thing has ever happened in my existence. Nor has work ever told me to stay at home (except of course of illness). Today was an off day, so I spent it as I would have at home. Huddled around my computer, writing and getting distracted by the Internet. With the exception of strong winds, nothing was amiss. The only thing that I can think of while the water drips all over the Bay Area, while people moan about poor city storm drains, the floods blocking multiple lanes on the freeways, and the downed power lines caused by wind gusts is…will my favorite fruit be better this summer? Americans hate being fooled. When box of butter has a picture of a redfarmhouse and a happy cow, the butter better be made in a red farmhouse with a ebullient cow standing outside in a grand bucolic environment. When a Youtube video says that it’s going to show the entire movie, it better show the entire movie even if it has 1000 views and 90% downvoted. When a sign says “Do not park here”, Americans certainly have a right to be angry when a car parks in that very spot. So that brings us to the super fascinating show that promises that a man will be eaten alive by the Amazonian predator the ANACONADA. Let me be honest here: I am an intellectual. The idea of forcing an animal to consume a person as a stunt is ludicrous and a waste of money. But the idea of going inside? YEAH. And there’s that itch that comes up for every American—I love seeing spectacle. It’s practically part of my blood. It’s partly why I take a quick look when I see a car accident (yes, my heart also goes out for the injured) or listen to arguments taking place in front of my apartment. So I settled in to watch the special with Chris. In 15 minutes, I fell asleep due to the repeated declaration that a man has decided that he wanted to be consumed by an anaconda. Now, I have seen one man CG consumed by an anaconda and that was Jon Voight in the so-so movie of Anaconda. He winked. But! Fortunately, my internal alarm is quite accurate and I woke up to find that the man was completely in the anaconda’s grip. Then he suddenly calls for help. Then he says he’s too tired now and that he will continue to find the biggest anaconda in the world. Apparently, he insisted that the armor on his arms and legs be removed. And that’s where the anaconda coiled its powerful body around and nearly broke his bones. Then it ends. WHAT! What happened to the #eatenalive? PETA is quite right in being angry for the treatment of the anaconda. But they also are very right in that the anaconda was deceived of its meal. That’s cruelty. Sometimes if you give me a plate of spaghetti and meatballs. My eyes tells my stomach, mmmmm….yummy foodie going into my tummy! The tummy roars in delight and then to have that suddenly taken away, that’s painful. That hurts. I will go into a rage, but because I am a small non-physical person, all I can do is pretty much whine and complain. So I can say is that Stephen Colbert is right. It’s cruel and unusual. For Americans, we were deceived like the anaconda. Instead of #eatenalive, we got #cuddledalive (#squeezedalive).